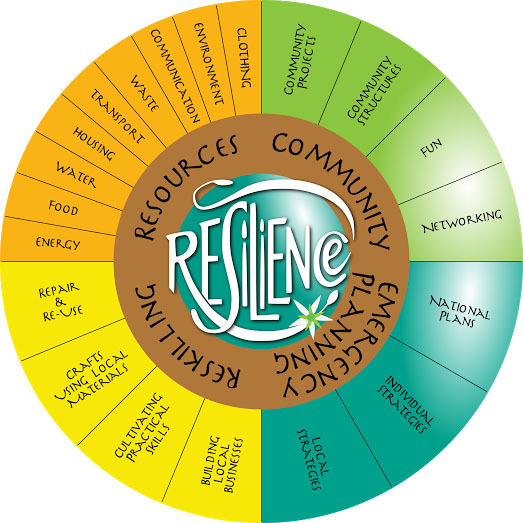 “The Resilience Handbook outlines how to proceed in an immediate and practical way. The Resilience Handbook is the guide to how the interacting complexities of modern life can be managed to create a future with less energy use, but a better quality of life. Resources are being depleted across the globe, while demand for them rises. Nations will have to move towards greater self sufficiency as their trading partners need to keep more for their own use. Our current lifestyle in Britain is dangerously dependent on non renewable energy sources, such as fossil fuels and nuclear power. Without substantial imports of food, we cannot support 70 million people on this island. Yet only seventy years ago, just after the all-out self sufficiency campaigns of the second world war, we could have fed our entire population. Craftspeople ran small businesses in every High Street where items could be bought or repaired. Town centre market gardens thrived. We could have built on this resilience to become a nation self sufficient in essentials, but chose instead to pursue the path of consumerism. Now, the High Street is occupied by chain stores who remove money from your local area as soon as it passes over their counters. The market gardens are car parks, and the population has nearly doubled. Environmentalists argue with politicians, scientists with religious leaders, and year after year nothing is done. The endless economic growth promised seems to have turned cancerous. Resource wars are flaring up. However serious the situation is, however impossible a solution seems, we arrived here slowly, one piece of shopping at a time. We need to take back our power and make new choices. While we still have access to fossil fuel energy, we can use it to rebuild a resilient culture. There’s no time to lose! Single copies cost £7 plus £2 post and packing within the UK; signed by the author. Once you’ve paid for the book, an email goes straight to my inbox with your delivery details and I post it to you myself. I can link your order to a separate message from you specifying a dedication! Discounts available for bulk orders (not signed).